An at-need funeral service is one that is prepared at the time of death. Usually one or more family members meet with the funeral director to plan the funeral. During this meeting, arrangement plans are made for service times and location, the funeral service wishes of the family and merchandise, such as the casket, vault, clothing, prayer cards, etc.. These arrangements are designed to help the family choose a funeral service that memorializes the life of their loved one. Many families in our area choose to say their last goodbyes through a Traditional Funeral Service with family and friends. A traditional funeral service is when your loved one is present and usually includes a viewing or visitation and formal funeral service that can be held in our funeral home chapel or at a church. Typically a time of visitation will precede the funeral ceremony. A visitation is a time when family and friends are invited to view the deceased and pay their last respects. This ceremony can be held in the funeral home chapel or at your church. A Memorial Service is a service without a visitation and the remains of your loved one are not present at the time of the service. The memorial service is a time to commemorate the life of your loved one. 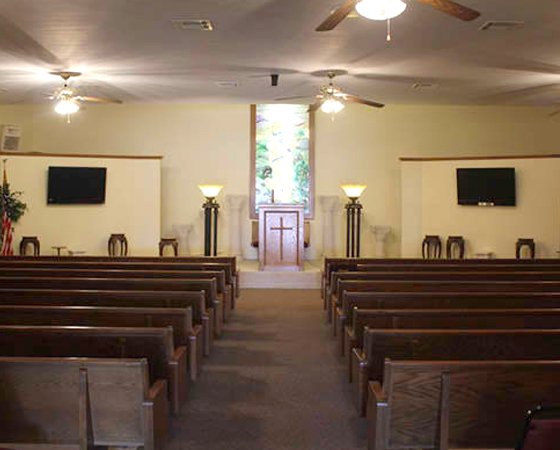 This ceremony can be held in our funeral home chapel, your church or other location. Selecting a Graveside Service meets the needs of families who need to view the body to gain closure and begin healing, but wish to avoid the formality associated with a Traditional Funeral Service. Families gather at the grave site where a brief ceremony is held to honor the memory of the deceased. Direct Burial is when burial occurs shortly after death. No viewing or visitation is involved, so no embalming is necessary, although a memorial service is often held in our funeral home chapel, your church, cemetery or at other location. Direct Cremation is when cremation occurs shortly after death, without embalming. The cremated remains are placed in an urn or other container. No viewing or visitation is involved, although a memorial service may be held in our funeral home chapel, at your church, or other location with or without the cremated remains present. Death sometimes occurs unexpectedly. If a death occurs locally and it is necessary to conduct services elsewhere, we are able to handle the initial preparation and transport the remains to another funeral home for services. Likewise, we are also able to handle the arrangements if a death occurs out of town or out of state and it is necessary to return them home for a visitation, service, or disposition.